Caixa Bu performs experiments to study the bright materials on Ceres. Ceres, the dwarf planet between Mars and Jupiter, is a mysterious and exotic world, with its complicated history and recent geologic activity. Since scientists can't currently visit or bring back a sample, they are trying to make a little bit of Ceres on Earth. We know a lot about Ceres from NASA's Dawn spacecraft, which explored the dwarf planet for three and a half years before running out of fuel in October 2018. Its data gave clues to the materials present on and below the surface of Ceres, which help scientists trace the history of the dwarf planet and figure out what's happening there now. In laboratories in the United States and Europe, scientists have been using Dawn's findings to create experiments that allow them to further explore these materials. They want to figure out not only what specific substances make up Ceres' surface, but also how those materials change over time and under different conditions. This has big implications for Ceres' evolution and activity, including processes involving water. "Dawn revealed new processes that warrant further investigation into Ceres' composition, history and activity," said Dawn project scientist Julie Castillo-Rogez, based at NASA's Jet Propulsion Laboratory, Pasadena, California. "Although the mission is over, we are continuing our spacecraft's adventure in the laboratory." A major analysis result from the VIR instrument is that the bright material on Ceres, found at hundreds of sites on the surface and most prominently in the large crater named Occator, is primarily made of a substance called sodium carbonate. It's a type of salt found on Earth in hydrothermal environments. Dawn scientists think a briny liquid likely spurted up from Ceres' interior and delivered this salt to the surface. This was surprising, as the formation of sodium carbonates requires a lot of water interacting with rock. Besides Ceres, sodium carbonate has been found on Saturn's moon Enceladus, which has an ocean beneath its icy shell. 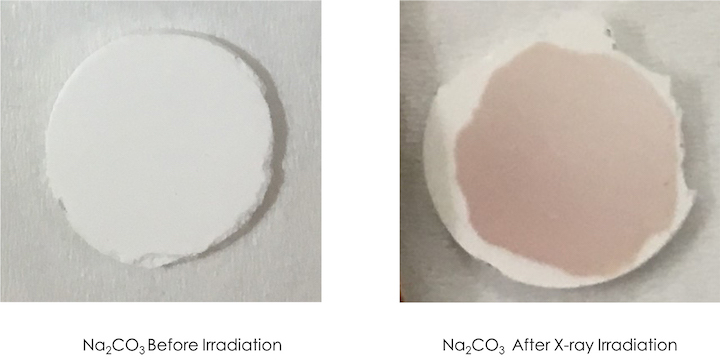 Researchers at Italy's National Institute for Astrophysics and France's Université Grenoble Alpes have been examining how different compounds of sodium carbonate reflect infrared light. The compound that is thought to match the brightest feature on Ceres, known as Cerealia Facula, is a form of sodium carbonate called natrite. In its pure form, this substance looks white, like sugar. Lab experiments show that sodium carbonate's spectrum — its light-reflection "fingerprint" — looks different at high temperatures than low temperatures. Dawn's observations of Ceres most closely matched the laboratory results from minus 40 degrees Fahrenheit (minus 40 degrees Celsius), suggesting that this is a good estimate for the temperature of the brightest area on Ceres. "It's very cool to try to reproduce in the lab what we have learned on Ceres, because when we start to make these kinds of mixtures and measurements, we understand a little bit better how these materials work," said Maria Cristina De Sanctis, principal investigator for Dawn's VIR instrument and co-author on a 2017 study that reports these results in the journal Icarus. Separately, a research group at the University of Virginia has been looking at the stability of sodium carbonate at Ceres-like temperatures, pressures and radiation levels. 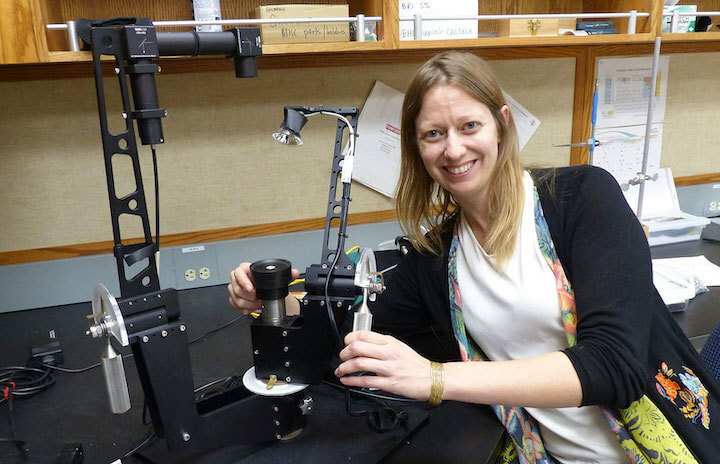 Catherine Dukes and colleagues have a barbeque grill-sized vacuum chamber that allows for observing different materials in various "space environment" conditions. While it is impossible to observe the real Ceres for billions of years, these laboratory experiments speed up time by exposing materials to much higher levels of radiation than Ceres experiences in a day. This allows scientists to see how the bright spots would respond to the Sun's radiation over a long period, which helps estimate their age. Scientists found that, in an airless environment like Ceres, sodium carbonate without water bound up in its molecules is stable, but darkens very quickly in response to radiation. "You can see the darkening with your eyes," said Caixa Bu, lead author on a 2018 study in Icarus, and researcher at the University of Virginia. "The sodium carbonate is bright white when you put it in, but after ion irradiation it looks like a smear of oil. It's pretty dramatic." Bu's experiments also examined how sodium carbonate with bound water would react to Ceres-like temperatures. It appears that these carbonates would be stable for hundreds of years at Ceres' coldest northern temperatures, but would lose water quickly at the warmer mid-latitudes. More research is needed to understand the implications. Another major result from Dawn was that Ceres is mostly covered in phyllosilicates — tiny rock particles typically found in mud on Earth. Across Ceres' surface, Dawn found a type of mineral that has ammonium (a compound derived from ammonia) incorporated into its structure. Scientists were astounded, as substances containing ammonia are not expected in bodies that formed as close to the Sun as Ceres' orbit. The result suggested that Ceres could have formed beyond Jupiter and migrated inward, or that it has materials that originated farther from the Sun incorporated into its surface. hlmann and colleagues found that a substance called magnesium smectite was the most likely match for the ammoniated clay that Dawn found at Ceres. The experiment confirmed what other scientists had suggested in 1992, based on telescope observations of Ceres from Earth, and in 2015 based on VIR observations of Ceres. Her study was published in 2018 in the journal Meteoritics and Planetary Science. "It gives us better insight into what Ceres is made of, and it supports an idea that had been floating around for a while," Ehlmann said. Ehlmann's results also raise questions about Ceres' relationship to carbonaceous chondrites, which are carbon-rich meteorites that have been altered by water and are thought to have come from bodies similar to Ceres. The study suggests Ceres has more smectite clays than some of these meteorites, meaning that Ceres and the carbonaceous meteorites may have undergone different types or degrees of alteration by water. Other valuable laboratory results have helped rule out substances that scientists initially thought Ceres would have at its surface. Simone De Angelis at Italy's National Institute of Astrophysics and colleagues found that while Ceres may have small quantities of a mineral called brucite, large amounts of it are unlikely based on the way it reflects light in the laboratory. Though its operational life has ended, Dawn remains in orbit around Ceres, where it is now the dwarf planet's only moon. Meanwhile, Dawn's findings have given scientists plenty of questions and clues to explore for years to come. Scientists at the University of Virginia find that sodium carbonate, Na2CO3, darkens when exposed to X-rays. 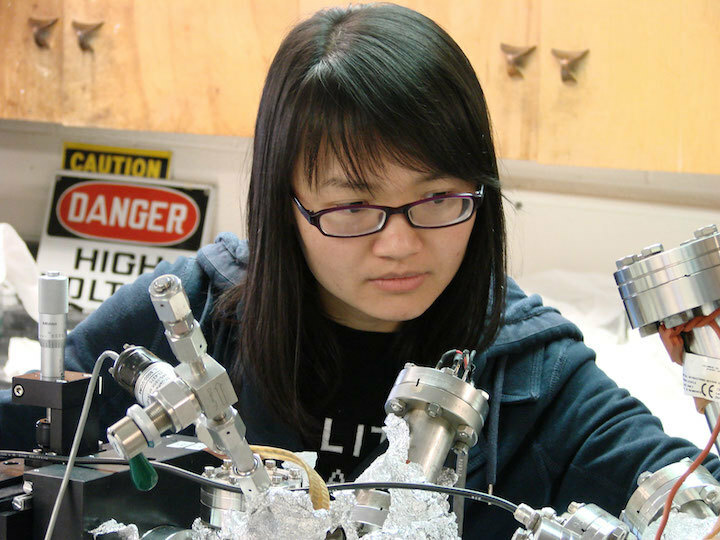 Bethany Ehlmann studies Ceres-like materials at Caltech.